Women in Australian politics: There's just not enough. Women in politics: Are parties doing enough to get women elected? 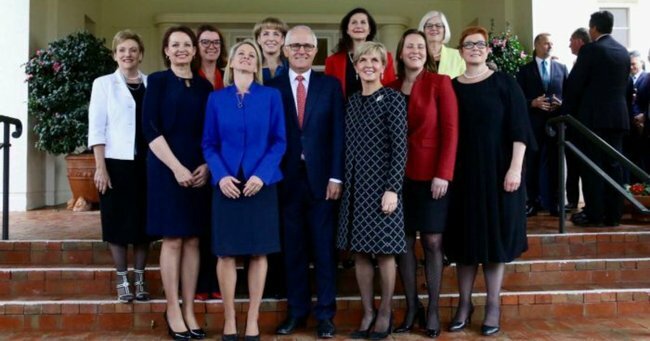 The Federal Opposition has taken aim at the Prime Minister after Malcolm Turnbull failed to promote any more women into his Cabinet, but female representation remains an issue for all parties. The swearing in ceremony saw one politician promoted to Cabinet — LNP Senator Matt Canavan — while two senior roles held by women were diluted. Assistant Treasurer Kelly O’Dwyer lost responsibility for the Small Business portfolio, while part of Defence Minister Marise Payne’s responsibilities will now be handled by the new Minister for Defence Industry Christopher Pyne. But the lack of women promoted to senior positions and parliament itself isn’t just a Coalition issue. The number of female politicians in the House of Representatives has increased to 42 — potentially 43 if Labor’s Cathy O’Toole wins Herbert — but women remain the minority in the Lower House, where 72 per cent of the members are men. The number of overall female candidates put forward by the major parties has been generally increasing over the past 12 years. But those numbers look less impressive when broken down into the number of female candidates put forward in seats considered winnable. While Labor did put forward more female candidates than the Coalition, only 27 women — or 65 per cent — were put into safe seats or those with a margin of less than 6 per cent. It’s a drop from the 2013 election, where 76 per cent of female candidates were in safe or marginal seats. The Coalition meanwhile increased its number of female candidates in marginal seats from 60 per cent in 2013 to 72 per cent in 2016, though the overall number remained low, at 37 candidates. The Greens have put forward the highest number of female candidates of the three major parties over the past five elections, but the lowest percentage in marginal seats, at 40 per cent in the previous election and 26 per cent in 2013. As expected, the low number of female candidates in safe and marginal seats has led to minimal change in the number of women elected. Deputy Labor leader Tanya Plibersek today defended Labor’s record for supporting women, citing the party’s target for 50 per cent of MPs and senators being women by 2025. Ms Plibersek said Mr Turnbull should have promoted more women into his ministry, instead of “demoting” Ms O’Dwyer and Senator Payne. “What we actually see is a Liberal Party partyroom which has fewer women; they’re actually going backwards in representation of women in the Coalition,” she said. Deputy Nationals leader Fiona Nash has conceded the lack of women elected to Parliament is a problem for the Coalition. Senator Nash told Sky News last night “we do need to do better”. “We do need to do more, there’s no doubt about that,” she said. “Not very long ago the NSW Nationals put in place a target of 50–50 male and female representation by 2025, which I pushed very hard for. Last week, Senator Payne also criticised her own party as not doing enough to get women into politics. “If there is a strategy, it’s clearly not working,” she said. “So we need to change that. “We need to make sure that we are identifying strong female candidates early; we need to make sure we are encouraging them in the positives of political life.